Descripción "Descubre a pliff y ploff en 5 idiomas: galego, español, english, français, deutsch"
Andrea and Monica met in Cee, Galicia, a little town on the northwestern coast of Spain. From a student-teacher relationship, Andrea and Monica quickly became friends and decided to turn their common passion for languages into a children’s book, introducing five languages of Europe - Galician, Spanish, English, French and German - side by side. Hailing from different backgrounds and different generations, the pair brought together their own unique experiences to give children the opportunity to discover other languages through fun short stories. 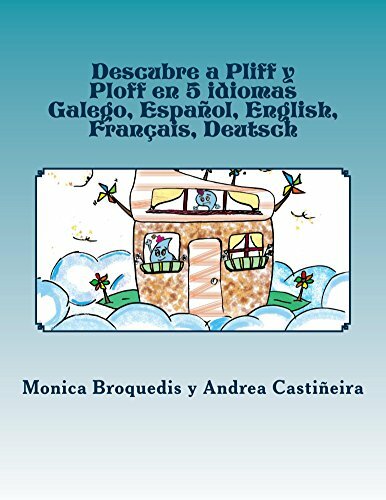 When the self-styled “Heidi” from Switzerland Monica moved to Andrea’s home region Galicia, she soon discovered that rain is a frequent visitor there, and was quickly inspired to create Pliff and Ploff, two Galician raindrops, to help teach languages to local children. But it was Andrea who brought Pliff and Ploff to life with her artistic talent. Living in the charming towns of Cee and Fisterra (also known as the “End of the Earth in Galicia), Pliff and Ploff can be compared to the Ying and Yang: Pliff is the positive one, always happy and generous- Ploff is the angry one, always grumbling and negative. Rather than listing out grammatical rules, this book offers a fun introduction to European languages through a series of translated short stories following the adventures of Pliff and Ploff. Suitable for children aged 6 to 12, the stories are intended to awaken children’s curiosity in one or more of these five languages, and will no doubt serve as an ideal tool to help children choose their preferred language for further study at school. It could be also interesting for adults to get a first idea of other languages. Finally, children will find a special quizz at the end of the book, and may submit their answers for a chance to win Pliff and Ploff T-Shirts, bags, umbrellas and more!